Magicians use cups for the classic of magic: The Cups and Balls. But, they are used in an atypical way - they are used upside down. This is a 180º turn from the original use and design of vessels we commonly associate with being mouth up, safely holding their contents, in a convenient size and shape for holding in the hand. Instead magicians invert them mouth down, so they trap, and obscure from view, any object that they are inverted over. This atypical use of the object we commonly call a cup requires a new glossary of terms so as to eliminate confusion - for inverting the cup 180º means the bottom is now the top and vice-verse. 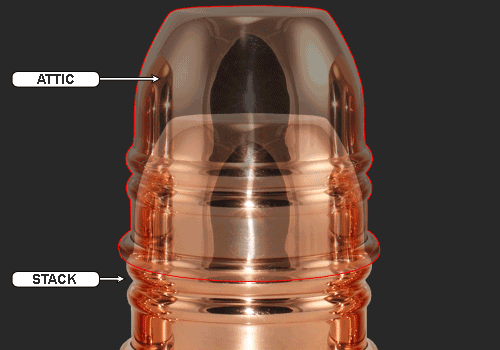 In addition to that, there are parts of the cup that have previously been irrelevant that now need clear nomenclature. 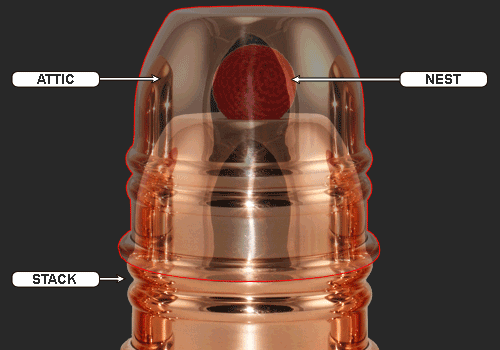 General terminology used to define the outside areas of a cup used for Cups and Balls Magic. SADDLES and DIMPLES both reside on the Top of a cup. They do have separate meanings. A SADDLE may be flat and have no DIMPLE. A SADDLE may be dish shaped with the deepest part of the DIMPLE directly in the center of the SADDLE. A SADDLE may be a depression that flattens out, leaving a DIMPLE that is a wide area. Dish shaped SADDLES with shallow DIMPLES are preferred by may performers because they center a ball resting on the SADDLE and keep the ball raised as high as possible. There is a need for deeper DIMPLES though, as when performers are working outdoors and want to avoid any possibility of a ball falling off of the SADDLE. SADDLE: the area on top of the cup where a depression or dish is usually formed. The SADDLE is the entire surface of the depression, from edge to edge. DIMPLE: the depth at the center of, or the lowest point of, the SADDLE. The inside areas of a cup used for Cups and Balls Magic are significant in determining the largest object that can fit into a cup. Any object can fit into the cup if it is not greater in diameter than either the INSIDE DIAMETER or the INSIDE HEIGHT, whichever is lesser. INSIDE DIAMETER (ID): the greatest distance between the inside surfaces of the MOUTH of the cup, measured in a straight line between the inside edges of the RIM. INSIDE HEIGHT: the shortest distance between the MOUTH of the cup and the DIMPLE, measured in a straight line, from the center of the mouth to the center of the DIMPLE. FLOATING: when an object greater than the INSIDE HEIGHT of the cup is placed inside a mouth down cup and the RIM of the cup will not fully rest on a surface. The cup will instead FLOAT above the surface. Cups and Balls Magic includes the use of more than one cup. Typically the cups STACK, one upon another. There is a lot of general confusion over whether or not a STACK of cups is mouth up or mouth down. We make no distinction between the two. A STACK can be mouth up, or a STACK can be mouth down. STACK (Mouth Down): one cup sitting upon another cup, resting upon the lower cup's SHOULDER. Multiple cups can be STACKED in this manner. STACK (Mouth Up)*: one cup sitting in another cup, resting upon the lower cup's RIM. Multiple cups can be STACKED in this manner. CUP HEIGHT: the distance from the MOUTH of the cup to the TOP of the cup, measured in a straight line, perpendicular to the TOP of the cup. STACK HEIGHT: the distance from the MOUTH of the lowermost cup in a STACK to the TOP of the uppermost cup in a STACK, measured in a straight line, perpendicular to the TOP of the uppermost cup. * In some cases the Mouth Up Stack has been erroneously referred to as "Nested", but the definition of "nested" does not apply to a state of stacked cups. Merriam/Webster defines the verb "nest" as "to fit compactly together or within one another". Specifically, each object would have to be smaller to fully fit within another, like a Matryoshka Doll (Russian Nesting Dolls). The term is only mentioned here for completeness and should not be used. When cups are STACKED, there are spaces created inside a cup used for Cups and Balls Magic. ATTIC: the space between the TOP of the lower cup and the TOP of the upper cup in a STACK. The ATTIC includes all the space between the SIDES of the upper cup. The size of the ATTIC is relative to the overall dimension of the cup and the placement of the SHOULDER. When balls are hidden between cups in Cups and Balls Magic, the ball is NESTED. A relationship between the diameter of the ball and the height of the ATTIC exists, as the ball cannot be a greater diameter than the height of the ATTIC in order to form a proper NEST. NEST: any ball that is hidden in the ATTIC between two STACKED cups. 2 BALL NEST: two balls hidden in the ATTIC between two STACKED cups. 3 BALL NEST: three balls hidden in the ATTIC between two STACKED cups. FLOATING: when a ball is too large to fit in the NEST, the uppermost cup will not fully rest on the SHOULDER of the lowermost cup. The cup will instead FLOAT above the SHOULDER. 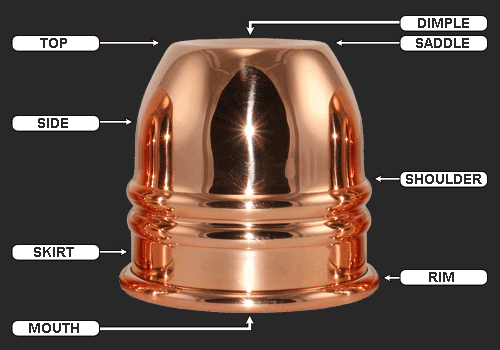 BEAD: any raised surface around the outside circumference of a cup. 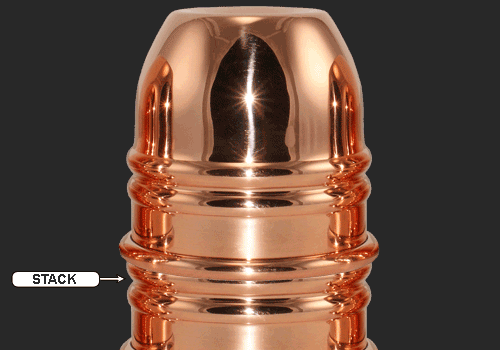 MOUTH BEAD: a raised surface around the RIM of a cup. SHOULDER BEAD: a SHOULDER formed by a BEAD. 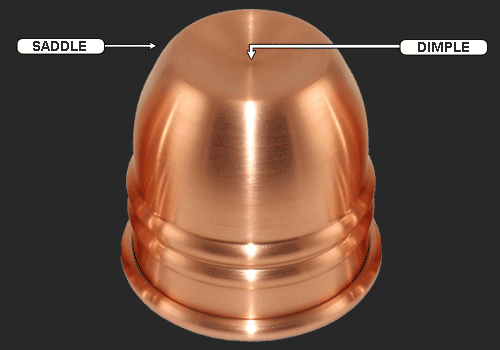 CENTER BEAD: a raised surface around the outside circumference of a cup located between the RIM and SHOULDER. 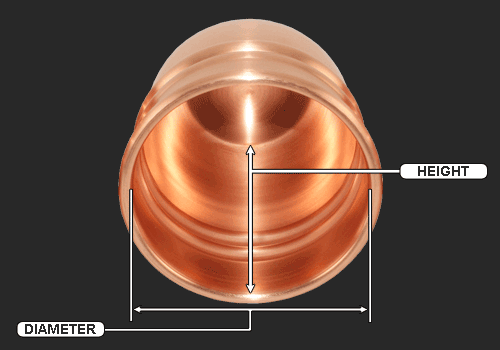 GAUGE: the thickness of the walls of the cup. Truly a wonderful wealth of knowledge on the cup nomenclature. This is the ultimate in cup education. Stunning breakout on cups dimensions. Thank you very much. I always thought that a nest should only be about the balls too. Someone went to a lot of work to make this information and pictures - thanks I'd like to see this be a standard.